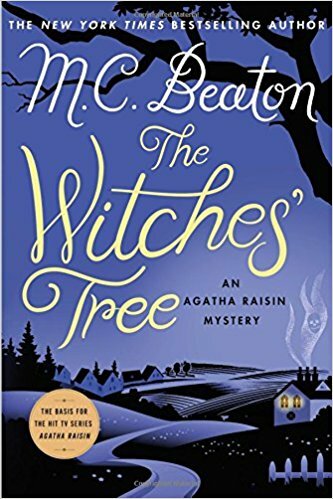 Beaton celebrates the 25th anniversary of her popular Agatha Raisin series with The Witches’ Tree, where Agatha gets to sink her teeth into a new case. This one smacks of more than lost cats when the new vicar and his wife, driving home from a dinner party in Sumpton Harcourt when their headlights pick out the dangling body of a murdered woman, hanging from a tree. Who murdered Margaret Darby, and what could the elderly spinster possibly have done to warrant such an action? Readers will be treated to the delightful banter between Agatha and Sir Charles, hints of romances, and more dark offerings to follow as a witches’ coven is involved–and don’t forget the pair of trust-fund siblings Agatha comes across. The absurb lives alongside the rational as usual. Fans will eat it up. The series has been made for British Television and some PBS channels as well as Acors TV will carry it here.